I won't get into much detail into this because this is one hike you don't want to get caught. It's yet another one of those "play ninja" type of hikes. But unlike the others (Stairway to Heaven or even Sacred Falls), where you are merely slapped on the wrist with a relatively small fine, this one can really land you in big trouble if you get caught. There are two entities that are present on Diamond Head Crater: DLNR and the military (not sure which branch). The latter is the cause for concern as they employ MP or military police on the premises. I am not entirely sure what their procedures are in handling trespassing hikers, but MP are one not to mess around with. I will forego revealing our starting point although realistically if one wanted to climb to the rim, it doesn't take rocket science to figure out where to start. Right off the bat, we were greeted by an angry sign "promising" retribution ("a $10,000 fine", "hazardous area", and "Turn back immediately!") ::sigh:: Up we went under a beautiful starry sky just after 11pm. We decided against using any light during the traverse so it was tricky to navigate in the dark but we quickly adapted. The climb was about 30 minutes and we were soon on the crest of the dark rim. The city lights of Honolulu / Waikiki glowed brightly behind the black silhouette of the rim. Inside the near pitch black interior of the crater were lights of an installation of some sort. We began our clockwise traverse, passing by a couple of old World War II pill boxes along the way before encountering a stiff but short climb to the highest point of the rim. It was here where the Diamond Head Lookout / summit trail terminus is located. From the last pillbox to the final climb to the lookout however, are rusty old barb wires that one must be wary of. It lays low on the trail at times, making visibility of it difficult. I ended up scraping my shin pretty badly against a bent pole that was holding the barb wire. Thankfully it wasn't the barb wire itself but I've never found out if that pole was rusted or not. And I'm not sure when I had my last tetanus shot. If I end up getting sick, then I'll know it was a long time ago. Thanks to the overall light pollution, it actually provided minuscule lighting on some areas of the ridge, further negating any need for personal lighting. Just before topping out, I've noticed that the main trail has been extended. The last time I was on Diamond Head was probably 4 years ago so I'm not surprised that some changes were done. 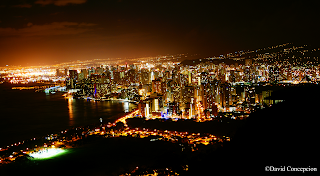 Upon reaching the lookout, we were greeted with probably the best urban vista I've ever seen at night! If you thought the views from the summit were amazing during the day, it is nothing compared to what one sees at night. It's too bad that this can't be seen legally. We spent probably well over an hour trying to get that perfect photo and to take in this rare moment of being on top of Diamond Head at night. The winds were blowing at a good clip but not too strong to freeze our okoles off although having a sweater with you is not a bad idea. The time was about 1am and we were reluctant to leave but it was getting very late. It was decided that we were to continue the clockwise direction and circumnavigate the rim in it's entirely until we reached our starting point. Beyond the lookout is another pillbox. Beyond that lies the most tricky part of the hike, a series of rocky descents with the ridge getting very narrow with good sized drops at times but nothing we couldn't handle. After the last major descent, the ridge takes on a more broader profile. Off in the distance we could see the glowing lights of the numerous subdivisions lining the south Ko`olau ridges and valleys. Further away was the greater Hawai`i Kai area. I thought I could make out Koko Crater but wasn't too sure. On a full moon however, the crater would stand out very well. We eventually reached a series of antennas and then a road that leads up to a building. Beyond the building was the most overgrown portion of the rim. We reached our starting point and made it down safely without incident. The time was just after 3am. Despite it's strict off limits nature, this is probably my favorite hike to do at night. I got an opportunity to join Chenay Borja, Josh Serrano, Nate Yuen, Laredo Muredo, Neelesh Fernandes, and Baron Yamamoto on an exclusive hike that reaches for a cave that lies high above Makua Cave. 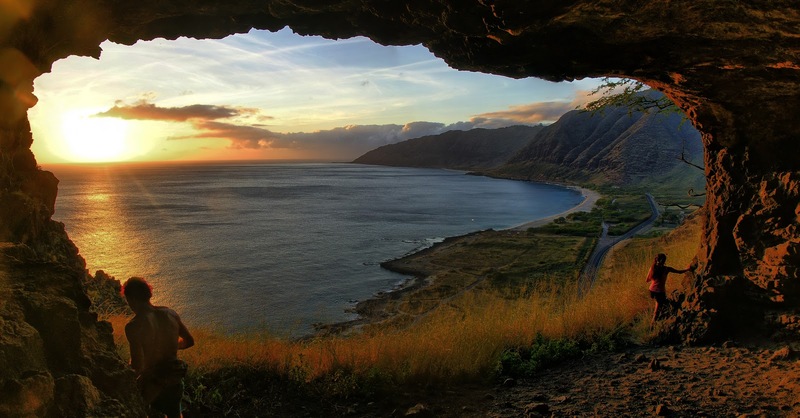 For those unfamiliar, Makua Cave is the massive cave that lies immediately adjacent to Farrington Highway just north of Makaha on the leeward coast of O`ahu. It was said that this cave was once at sea level and that a half shark, half human demigod made it his residence. It was also thought that the cave traversed through the Wai`anae Range and exited on the other side somewhere near the North Shore. One can enter the massive opening and proceed mauka until the tunnel becomes literally a crawlspace. The cave is moist and cool, whereas just feet from it's opening is a staggering hot highway. We looked up and spotted another cave high above and pointed out a steep grassy gully that provides access. The climb is extremely short, probably 15 minutes or less. But I have to say that this was by far the hottest short hike I've ever done. The sun pounded us relentlessly as we huffed and puffed our way up through the thick dry grass and brushes. After maybe 30 minutes, we reached a point in the climb where we began contouring carefully southward and we reached a smaller cave after rounding a bend. Beyond was the actual target cave and it was all wow from there. Sitting from inside the cave looking back out, we easily made out Yokohama Beach and the remaining coastline to Ka`ena Point. The shape of the cave provided the best natural frame for photos. We even pointed out that it resembled a movie theatre screen. We had snacks and waited eagerly for the sunset. Baron was running late and he just started his climb as soon as we settled in. At the same time, Nate called it a day and bid his alohas. Off he went back down. Shortly after, Baron joined us just in time for the sunset. Finally, a hiking entry has arrived! I apologize for the lack of entries as I have devoted more time to flying (work) and flying (RLU-1 Breezy), along with other miscellaneous activities. On top of all of that, I am aiming to start training for flight school to receive my private pilot license, a childhood dream. With all of this, DGC's Hawai`i Hiking Tales is no longer a top priority. But with followers like you keeping this site going, I am inclined to bring you entries from time to time. I have reconnected with an old 808 Goonies favorite, Chenay Borja. She has been on a hiatus status lately but her schedule has freed up a bit more and I am looking forward to more adventures with her, Goonies style! Together, we embarked on two hikes that both begin at the Nu`uanu Pali Lookout. Due to their short duration, both can easily be combined for a nice little half day hike. They are the Pali Puka and Likeke Falls hike. 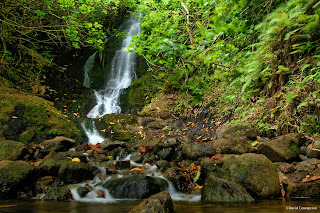 Since I've done the Puka hike numerous times, I won't get into much detail here, but the Likeke Falls was my first time. In fact, this would mark my very first waterfall hike for this year! Joining us were Bogie, Miha, Mabel, and Kalani Napulou, whom I've finally gotten the opportunity to hike for the first time. We pushed off for the Puka after 8am and made it in little as 30 minutes. It was a nice way to revitalize my ridge walking side of me. It was also an opportunity to test a duplicate pole that I use on the RLU-1 Breezy experimental aircraft. Because of it's extendable feature, I was able to get in some unique camera angles that the following video will show. Back at Pali Lookout, we began our walk down the old Pali road until reaching the junction of the Maunawili Demonstration Trail, a 10 mile one way hike that skirts the base of the Ko`olaus, ending at Waimanalo. We took the route that leads to the Likeke Falls, and soon we found ourselves on some switch backs that lead us to the "new" Pali Highway. The trail then dropped down via some very unreliable wooden stairs/ladder to cross underneath the highway. The graffiti on the overpass beams and support structures made for an interesting work of art to say the least. To get to the other side of the highway, one can either go thru an extremely narrow corridor on the left or duck extremely low under the bridge. Once on the other side, we popped out onto a grassy area that made up the median of the Pali Highway. Cars zoomed passed us on both directions, some drivers looking at us curiously. Continuing on, we went underneath the second overpass with more "beautiful" graffiti art and picked up a trail leading into the forest. Soon we walked on an old road for some distance before turning off to another forest trail. When the forest canopy opened up at a few spots, we could spot the massive windward cliff and the Pali Puka itself, looming high above us. Soon we were at the Likeke Falls. We took time to enjoy the falls and have lunch. Chenay, Kalani, and I proceeded to climb a muddy embankment to get to an area of the falls where there's a narrow ledge that one can walk on to get a nice cold shower from the flowing falls. We noticed that the trail just before turning off to the falls still continues beyond to some other place, one that I will explore on another day. If you are looking for short hikes, the Nu`uanu Pali Lookout is a nice area that offers quite a number of choices. 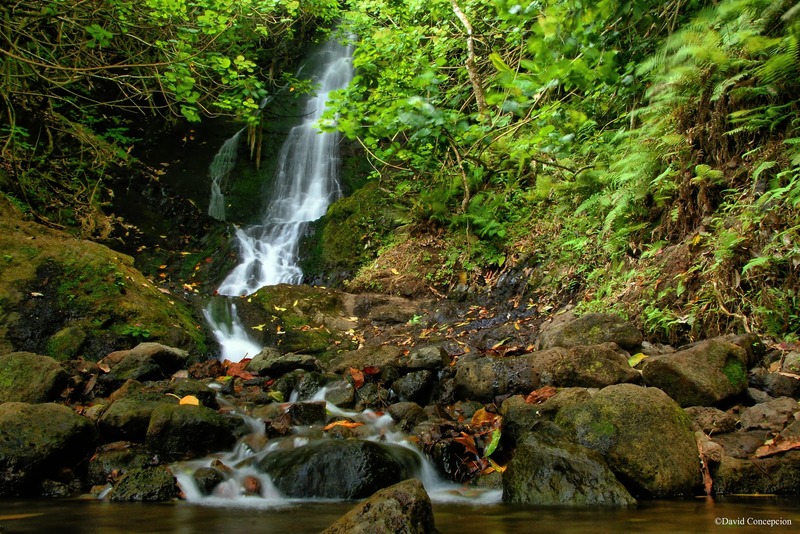 Aside from the two hikes we did today, there's also the Pali Notches and the aforementioned Maunawili Demo Trail, which also connects to the Mauanawili Falls. Give these hikes a try.